The squadron moved to Jessore on 19th. December 1942. This period at Jessore lasted only a month but saw another remarkable demonstration of the fighting quality of 113 when, on 19th. January 1943 during an attack on Akyab, a most important supply port for the Japanese, the flight of five aircraft, led by F/O Giles, was intercepted at 15,000ft. by two enemy fighters. During the course of three separate attacks the evasion tactics of the leader, including diving rapidly to a height of 10ft. above the sea, were so successful that all aircraft returned safely and undamaged. Other moves followed, first to Feni, then Chandina and on 4th. May 1943 to Comilla Main for what is described in the Record Book as the `monsoon period' during which in 1943 the RAF was ordered to remain operational over Burma. This doesn't seem to have been a very successful deployment for the squadron as on 30th. May it was reported that, `only two aircraft were ready for immediate use, the remainder being bogged down in the mud'! Despite such difficulties, and the upheaval of no less than five changes of base in six months the squadron operated continuously but it was paying a heavy price. The Blenheim V losses continued to mount and by June 1943 the squadron had lost 14 aircraft in accidents and on operations. One such occured on the 06/06/1943 when BA916 Mk V crashed on overshoot near Comilla on return from an aborted raid to Kalemyo. 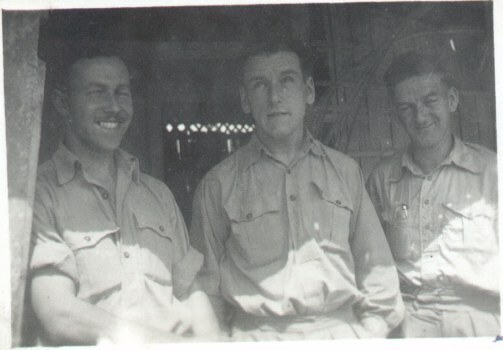 F/Sgt Les Ward , F/Sgt Ray Gilchrist , Sgt. Gerry Theobald were all killed. According to W/O Jack Barnes the runway was under repairs at the time and that there were hundreds of natives on and around the strip carrying baskets of rubble on their heads. Pilot F/Sgt Ward was forced to go round several times before he could land, as W/O Barnes recalled, the plane stalled and crashed in flames. All were killed 06/06/1943 when their Blenheim V crashed on return from Operations. By this time W/Cdr. Jones had been posted but he was not replaced, the squadron being led in this last period as a bomber unit by Major Viney, a South African Air Force officer, who had been one of the flight commanders under W/C Jones and a well liked prominent member of the squadron for a long period. Although nothing is stated in the Operations Record Book about the reasons behind the decision to change the status and the aircraft of the squadron at this time, it is clear that many of the personnel were disappointed at the proposed break-up of what had become a very close knit and efficient fighting unit with a long and proud combat record from the commencement of the war. The change of its role in the war for 113 was effected in August, and it was from Feni that the last operational flights as a bomber squadron took place on the 14th. and 15th. August 1943 with the official Stand Down and a squadron farewell dinner (not, as it happened, to be the last of these) the following day. 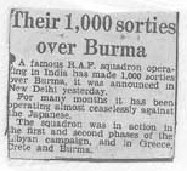 (Click here to see copy of First Farewell Menu) So the squadron was in action to the very end of its sixteen month period of activity from bases in India during which, according to the Record Book, 1130 daylight operations (sorties) were carried out, an outstanding achievement. This figure was confirmed in an odd way by `The Statesmen' magazine which is said to have featured an account of the squadron in its issue on 10th. June 1943 in which it is stated that 113 was the only unit in the area to have carried out over 1000 sorties and to have dropped over a million lbs. of bombs.